In the immortal words of a certain Noddy Holder, it’s CHRIIIIIIIIIIIIISTMAAAAAAAAASS! (well, nearly). And if you’re not excited by now, you certainly ought to be after reading our “twelve pages of Christmas” feature – it’s full of ideas for every aspect of the Yuletide season, plus information on Christmas light switch-ons and festive events in our villages. 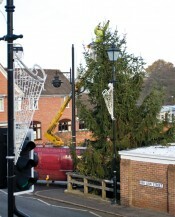 In Alvechurch, the Christmas spirit is certainly alive and kicking – after some uncertainty over the provision of the village Christmas tree, a 30ft specimen (pictured right) was kindly donated by two Weatheroak residents, and its branches are now twinkling with the new and improved set of lights. Barnt Green’s official switch-on is Friday December 10, when villagers can come along to join in the carol singing and enjoy a festive mulled wine. The Parish Council have promised that the display of lights will be worth waiting for. Blackwell’s event is on December 3 at 6pm, with carols and a visit from Santa followed by a procession to the Christmas Fayre at Blackwell First School. Lickey’s is on December 5 at 5pm, featuring Blackwell Concert Band, mince pies and Santa. Cofton Hackett’s tree is already looking lovely, while over in Finstall, residents can gaze not only on their own tree at the Village Hall but also the annual display of lights in a front garden on Alcester Road – it seems to get bigger and better each year, and it’s all for charity. On December 17, there will be carols outside the Village Hall (and refreshments inside!) led by the choirs of St Bartholomew’s and St Godwald’s. On the subject of decorations, one local business has had its products recognised in very high places: a Christmas wreath created at Woods Farm in Shirley will take pride of place on the most famous front door in the land after winning first place in a national competition. Marie Gilbert from Woods Farm (pictured here with sister-in-law Ragni) designed and made the decoration for No 10 Downing Street, battling it out with growers from all around Britain in the annual competition run by the British Christmas Tree Growers Association (BCTGA). She was delighted when her wreath won the chance to adorn the Prime Minister’s residence, while Woods Farm was voted the best wreath maker of the 380 members of the BCTGA. Marie’s husband Graham and his brother Geoff have been growing Christmas trees at Woods Farm for the past 30 years, and all holly and foliage used in their wreaths is fresh and grown on the farm. Marie and Ragni are now making a fresh wreath for No 10 to the same design as her winning entry – and they will both travel to Westminster to hand it over in person. So if you want to take a (holly) leaf out of the PM’s book, pop over to Woods Farm and choose your own wreath – or some holly, mistletoe or a real tree! Natural decorations are just one way to make your home look fabulous, and you’ll also find a great selection of real trees at Hopwood Garden Centre and Little Heath Garden Centre (which also offers all manner of baubles, lights and gifts). Beautiful and unusual homeware and giftware can be found at Tony’s Handyman, It’s A Gift and The Joshua Tree, while those seeking to spoil someone special can check out the luxurious lingerie at Temptations. or the glittering jewellery at Cupitts or RF Collyer. Bromsgrove Golf Academy is offering practical gift ideas in the form of VIP golf lessons, which would also be a great way to keep fit and healthy into the new year. Meanwhile, ladies-only gym Gently Does It and your local Lighter Life consultant can provide all the help and advice you need to get into shape after an indulgent Christmas. If a new look is on your Christmas wish list, you could consider a teeth whitening treatment at Barnt Green Dental Centre or an anti-ageing procedure by Skin Deep Aesthetics. Further non-surgical procedures are offered by Anita Powell, who can also help you eradicate unwanted hair. You could opt for a new hairstyle or some glitzy extensions from Bliss Hair Therapy or All About Hair 2, while Beauty Within and Beauticle provide a range of beauty treatments to keep skin and nails in top condition. Once you’ve pampered yourself, you’ll want to show the world how lovely you look, and no doubt there will be plenty of opportunities for socialising over the festive period. If it’s your turn to entertain friends and family, you could always take them to the good old Dodford Inn for a traditional pub experience, but if you need to cater for the masses at home then a barrel of beer from Weatheroak Ales is always a winner – perhaps soaked up with some delicious Indian treats from The Spice Trade. Whether you’re stocking up your own drinks cupboard or taking booze to someone else’s party, you will discover a wonderful selection at Drinks World in Alvechurch (based at the former Thresher store on The Square). Run by a family from Hopwood, the business offers an extensive product range from specialist wines, beers and spirits to everyday value items, and promises that its Christmas promotions will make its prices the cheapest in the local area. Drinks World is an ideal place to visit if you’re planning a big party as you can purchase on a “sale or return” basis. Look out for the great selection of beers from around the world, as well as many locally-sourced products – and don’t forget that the friendly staff will be happy to source specific items upon request. Finally, the recent spell of suitably wintry weather has got people talking about the possibility of a white Christmas. . . make sure you stock up on rock salt from Red Robin Garden Services so you can stay safe while enjoying the scenery!